On Tuesday I co-chaired the Ivalua Now customer / user event at Kings Place, near Kings Cross. 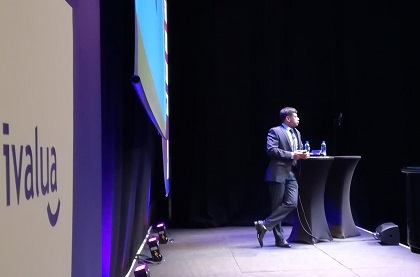 It’s a very nice venue, kitted out for professional theatre and music shows, so top-class in terms of lighting, sound etc – which was appropriate as the theme was “the Voice of Procurement”. Co-chair with me was Alex Saric, the Chief Marketing Officer who joined Ivalua last year after some years with SAP Ariba. Franck Lheureux, their new General Manager for EMEA, kicked off the event and he had a good story to tell with things going well for the firm right now. Spend Matters Solution Map got a mention, not surprisingly as Ivalua came out very well in that detailed technology analysis undertaken by our US colleagues. I was on and off stage, doing the opening and closing with Alex, introducing speakers, facilitating a panel discussion and Q&A, so I didn’t have much time to listen or take notes, but here are some general impressions from the event. A decent turn-out; there were over 100 registrations, which given this was the first ever Ivalua event in the UK, was pretty good. Even with a few no-shows, the room felt pleasantly full. There are bigger events coming soon in France and the US too if you can make those locations. Ivalua are expanding; revenue growth is very healthy, the firm is profitable, and the injection of funding last year from KKR is supporting an increase in the pace of recruitment in new and developing markets for the firm. There has been steady growth in UK-based staff, and this year the headcount should get to at least 15 people. France and the US are still the primary locations, but there will be expansion in the Nordics and Asia as well as here. Their partner infrastructure is developing too; I met Consus, who are major implementation partners (working in a similar manner to firms like Zoomworks and ExceleratedS2P) for Ivalua in other parts of the world and are opening an office in the UK now to replicate that support. PWC, OJC Consulting (another established implementation partner) and KPMG were also sponsors. An international bunch of happy customers, with varied needs – well, I guess unhappy ones don’t come to these events! But to get customers from Finland, Switzerland and India to come and speak was impressive. Customers like both the capability of individual Ivalua modules (e.g. sourcing) and the extent of the whole Ivalua suite. Several I spoke to were at fairly early stages on their “procurement journey” but saw the Ivalua product as one that they could make more and more use of as their own procurement matures. A great example of dedication to your firm – Hemant Gupta, the CFO of Blackberrys spoke – they are a top Indian retailer of fashionable gentlemen’s clothing. Hemant is a very trim and fit-looking gentleman, but he told me that when he joined Blackberrys, he was overweight and unfit. He felt that as CFO he should be able to showcase his firm’s clothes (take a look here, very smart). So he managed to go from a 40 inch to a 31 inch waste and lost several stone (20 kilos maybe) in weight in a short period. He showed me the “before and after” pictures and it really was very impressive and a great demonstration of corporate dedication! Music as a theme … worked pretty well. We’ll come back to some of the analogies I drew between procurement and music, although I was very disappointed Alex wouldn’t let me play Bad Romance by Lady Gaga on my Melodica …! Peter – we will have to save that performance for next time! !